Flex has been producing innovative tools for professionals since 1922. We sell their safety vacuum cleaners because they are built with great attention to detail and use superior technology to offer reliable performance for years. 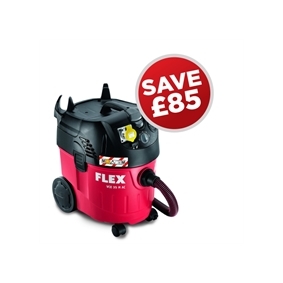 Flex safety vacuum cleaners come with an automatic filter cleaning system for wet or dry dust extraction. They are robust, easy to control and quiet to operate. Flex's flat and round edge wall and ceiling sanders are light and robust and have been ergonomically designed for comfort and speed. If your Flex tools break down please contact us to find out how one of the trained technicians in our repair shop can help. Can’t find what you’re looking for? View our full range of taping and jointing tools for perfect drywall finishing or call 0115 984 9148 to speak to one of our drywall tool experts.